Oh wait I didn't go to the ball game. Chris and my brother-in-law, Ralph, went to see the Yankees vs. the Mets tonight. I took advantage of the of the situation and did a little shopping and picked up a sandwich from Bradley and Wall. 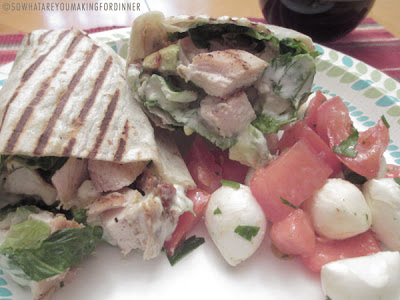 I got the Avocado Wrap – Grilled Chicken, Avocado, Tomato, Romaine, Bacon and Parmesan Cheese.Yum! Also got a little Tomato and Mozzarella Salad. And I got the cutest top at the Loft! And those jeans from J. Jill!